Oceanus 35, PTA balloon dilatation catheter receives CE Mark Approval for new catheter length of 200 cm. Barcelona, December 28th, 2017- Oceanus 35, PTA balloon dilatation catheter receives CE Mark Approval for new catheter length of 200 cm. 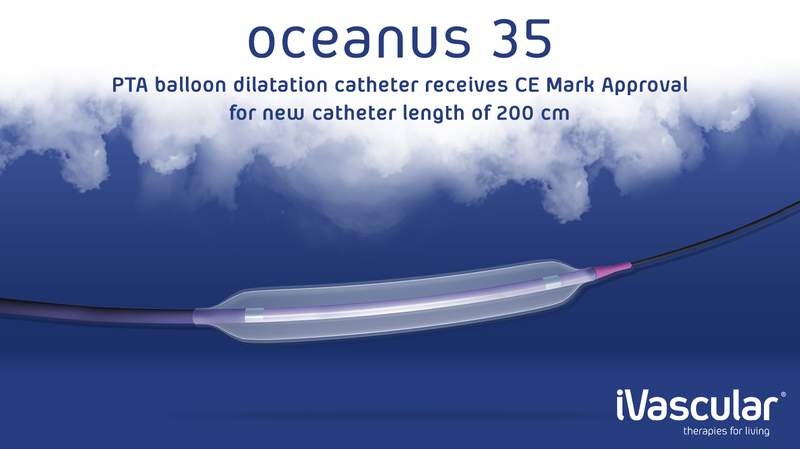 iVascular is pleased to announce that its Oceanus 35 PTA balloon dilatation catheter has received CE mark approval for its new usable catheter length of 200cm. With this, iVascular offers a complete portfolio including the lengths 80cm, 140cm and now 200 cm. Oceanus 35 is the only PTA balloon catheter in the market that offers such useful catheter length. Oceanus 35 is designed for dilation of stenosis located in the renal, iliac, femoral, popliteal and infrapopliteal arteries, and for the treatment of obstructive arteriovenous dialysis fistulae, native or synthetic. “With this new catheter length, iVascular is proud to further expand our complete portfolio for the treatment of endovascular diseases. We aim to adapt quickly to the markets and to offer solutions that will satisfy the physician’s needs”. – said Lluis Duocastella, CEO of iVascular. Navitian, iVascular´s new coronary microcatheter receives the CE mark approval. iVascular acquires 10% of the shares of the American company NaviGate Cardiac Structures, Inc. for 10 million dollars. iVascular reveals 24 months outcomes of Anchor trial and presents outcomes of two major RCT at TCT 2018.